Thread: Matt Coleville's Strongholds and Followers on Kickstarter. However, what does this mean for those of us who come here. Well, as Matt mentions in the video, he was a major writer in the closest thing 3.0/3.5 had to mass combat and kingdom management that had an official release named "Fields of Blood: The Book of War". He also is a lover of the Birthright campaign setting (for a slightly attention deficit disorderly twitch talk on the setting itself, you can find him on twitch at mattcolville), and has actively used several version of the upcoming Stronghold's and Followers rules in his own games for years along side of mass combat. Last edited by nickgreyden; 10-29-2018 at 02:09 PM. There is a new(ish) Kickstarter for a supplement to 5E D&D called Strongholds and Followers. It has already been funded and contains a live streaming component. It just passed $1 Million. It looks like it would fit really well with a 5E D&D Birthright setting. They are adding Pirate rules for a stretch goal that makes me think of Drachenward. I signed up for the PDF and plan on using during the play testing phrase. If you're looking for a set of rules for 5E D&D domain ruling, this may be what you're looking for. Well the kickstarter is over, 2.1 million raised, and I'm in on the playtest. I'll stop by this post every so often once the playtest is out and fill everyone in on how it is going. If you got some time, I made a playlist of 4 videos of Matt's talking about what the book is and is not. The last is what exactly a "codex" is and what they do. They seem neat. Sad I just missed the kickstarter, thanks for sharing the video though. Richard Baker actually pointed me in it's direction - hope it's a great product. Ouch, yeah, I'm quite sad that I missed this as well. Saw the most recent post and it drew my attention to this, but since I've been gone for quite a while I am not surprised that I missed it. Just wish that I would've caught it in time to be able to get a copy of the book at least. The book will be available for purchase once it is complete. Sometime in the near future, the kickstarter page will have a "pre-order" button. Matt plans to also have shop set up on his website. MCDM (I'm at work and can't look up the actual webpage, but that should be enough info to find it). The only thing that will be kickstarter only are the mini's and the shirt. Like I said, I'll be in here talking about how the playtest goes when I get the stuff in. So, the book itself contains all the stuff for having a stronghold and all the cool things you get for having it, most of which provides limited character buffs but are also just cool things to have. The adventure that comes in the book is actually a pretty good sized and well thought out, but I feel as if it is slightly railroady, but that is personal taste. This isn't lack of forethought, it is how it is designed. The warfare rules are a light edition but I really like them (except for one thing, more on that later). The followers, the charts, the new monsters, and some of the over 100 magical items are all spot on. The artwork was done by several different handpicked people as well as a couple of art houses. It walks the gambit from pretty good to fantastic (though I've only seen a portion). Like I said previously, I was in the playtest and man oh man did those playtesters tear that thing apart! Theory crafters and statatitions and excel wizards and impromptu game runners and rules lawyers and balance freaks put that thing through the ringer! I have no doubt that some of the playtest packets I got had major rewrites and there was also quite of bit of clarification needed in a few areas. The sad thing is I didn't get to see the whole thing. There are some large sections that never made it to the playtesters and that wasn't a good call imo, time is an issue and Matt has said frequently that it will evolve over time. Newer versions will have errata fixed in their printing and online resources will be available for older versions. Plus they have (a few) in-house people to take a look and that is always a plus. Anyway, I feel that this whole book can easily be adopted for use in Birthright with only a few minor tweaks from the DM (mostly the special abilities you get for your class as they change every D&D edition but they are common so it shouldn't be a big deal). Likewise you can hand-wave them away as bloodline powers. The warfare system is very strong and I like it a lot except for the fact that you don't field your armies in a wargamey kind of way, they just all attack. Kingdoms and Warfare looks like it will be the next book and will add more stuff that armies and their commanders can do as well as some more stock armies to use, but aside from this thing that I'd throw out the nearest window, I'm quite a fan of the warfare system right now and it fits right in with birthright. Anyway, that is the end of the update. Below is a brief description that I feel comfortable with revealing without giving anything away. I'm pretty sure Matt has covered all of this in several different places but thought I'd do a quick once over. Castles - You get bonuses to defending them and some extra rolls for followers but they are expensive to have as they are made up of a combination of the other strongholds. Keeps - Probably built by marshal classes. Gives minor combat bonuses. Temples - Probably built by divine casters. Allows summoning of entities (specially made for this product) if you've been a good boy or girl. And some of these... things... summon an army to aid you... and they are nasty! Towers - Probably built by arcane casters. Allows for faster spell research and even some personalized spells. Really excited for this and to plug it into Birthright! Want Ray of Frost to also remove all armor and clothing for one round? You can do it? Cast a buff on your ally and watch as they leave a fire trail behind them when they move? Sure! Establishments - Makes money. Gives some good spy info. Allows some special actions in social and knowledge situations. All of the above can be upgraded to give you more cool stuff including free units, abilities, and followers. Followers - if you own a stronghold, you'll get armies and followers. Followers and artisans do everything from making you money, to reducing the cost of doing stuff on your land, to making you magical items... if you bring in a few things. Armies/units - They work a lot like Birthright. Roll a d20, add their attack, if it beats the enemy's defense you hit. Roll a d20, add their power and try to overcome the enemy's toughness. If it succeeds, they take damage (it is like rolling attack and damage). If their casualty dice (read: hp) is half their max dice, the damaged unit is "diminished" and must make morale rolls to stay in. 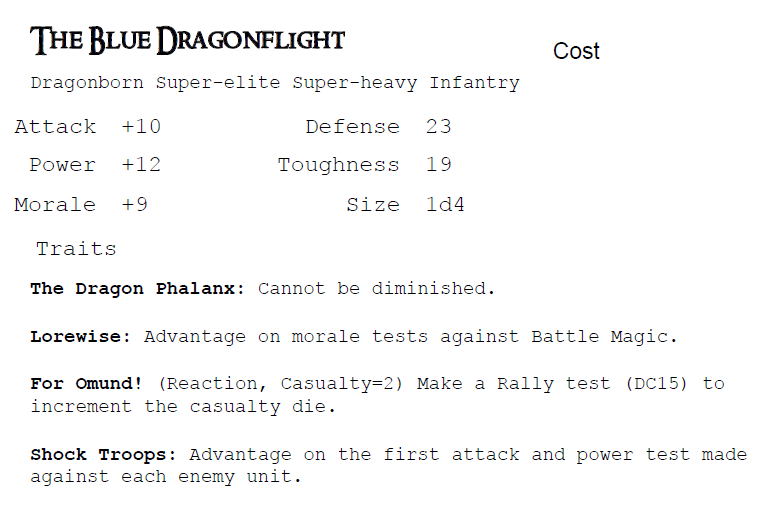 You can have a small unit with a lot of power (like a dragon or three would be a unit) but not a lot of casualty dice. You could have a large unit like 400 levies (with a lot of casualty dice (casualty dice max out at a d20)) but not a lot of attack or power or defense or toughness. There are also three important keyword indicators that affect their stats: how experienced they are (Irregular to Super-Elite), what is their equipment (Light - Super-Heavy), and what type of unit they are (levies, infantry, archers, cavalry, airborne, fortification, and seige). Each one is given a cool name and every unit has something special they can like automatically making a morale check or shrugging off a casualty loss. Each type has certain rules like archers cannot be attacked by enemy infantry while your infantry is still on the field. (Another reason I'd toss that rule where you don't field your army). 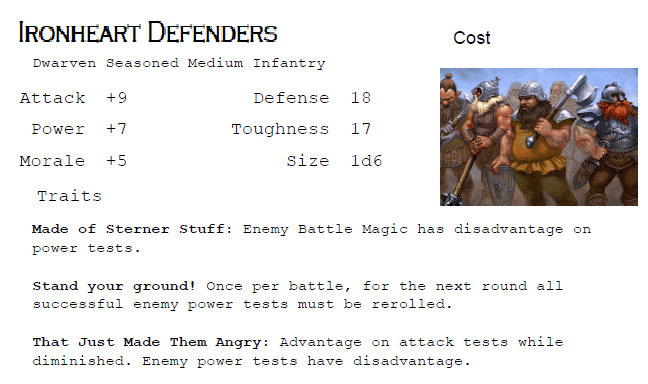 Here is a couple of units that have previously been shown outside the playtest. Last edited by nickgreyden; 10-29-2018 at 02:23 PM.